We made several plans to go to Nair Mess. Warned by friends to be there at a certain time otherwise there would be a huge crowd or the food might run out, going there just never seemed to work out. And then it happened. 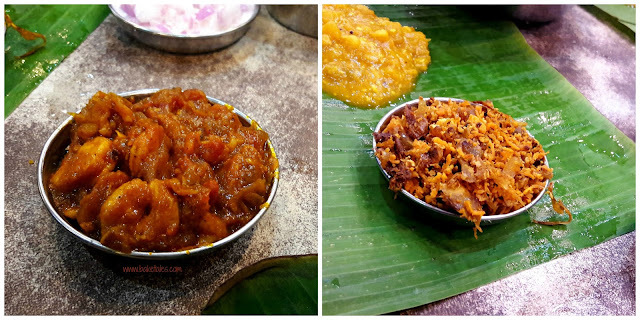 Situated in a nondescript lane off Wallajah Road at Chepauk, we wondered for a minute if we had reached the right place. Street vendors point the way and there it was - almost at the other end of the lane. The “mess” is a largish room with wooden tables and chairs; the place is full of people who have come only for the business of eating. We were lucky to get a table right next to the cashier. Banana leaves are placed on the table, glasses of water appear. You sprinkle some water from your glass onto the leaf, push the water around to do a rudimentary cleaning of the leaf and lift and shake the leaf so that the excess water drips off. Almost immediately, a bit of citron pickle, cabbage poriyal and lentil and yellow pumpkin kootu are spooned onto the leaf. There's also a bowl of plain rice. We order 2 fish meals and a plate of mutton biryani. 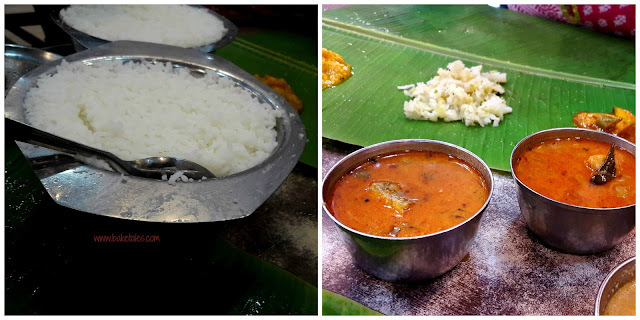 The fish meal consists of rice and the accompaniments described above and a small bowl of fish curry. They also serve rasam and sambar if you ask for it. The mutton biryani is served with onion raita. We also order fried fish, prawns, sora puttu, mutton curry and chicken Chettinad. The cabbage is speckled with grated coconut and tastes, well, like plain cooked cabbage. I like the yellow pumpkin, it’s thick and has a slight sweetness to it. The fish curry is so watery that it tastes bland and if not for the piece of fish in it, one wouldn’t even know what it was. As for the sides, the prawn masala and sora puttu are served in tiny little dishes, more like lids of containers. I can’t bring myself to taste the shark that’s flaked and mixed with coconut scrapings – had enough of it during my stay at hostels. The prawn tastes nice so we order a second portion, this one has a strong coconutty taste and the prawns are fresher than the first lot. The fried fish is good – palm sized and the thinnest slices of fish I’ve ever seen - they could give slim mobile phones and watches a run for their money!! 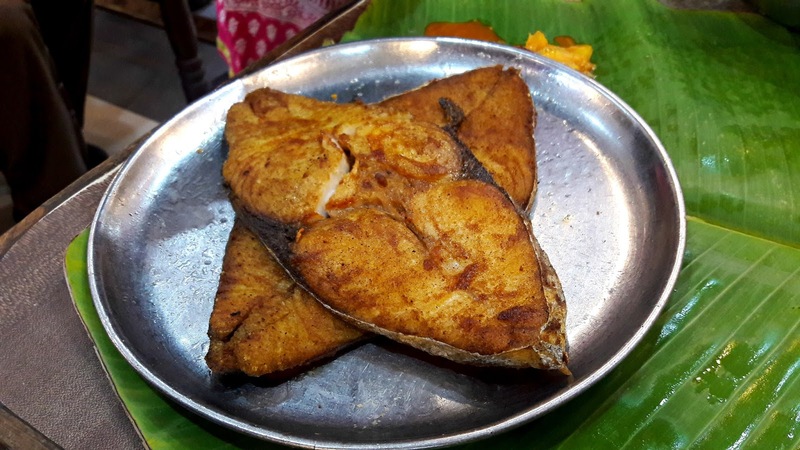 The fish is fresh, lightly coated with masala and fried just right – crisp but still moist. I tried a spoon of the biryani rice. 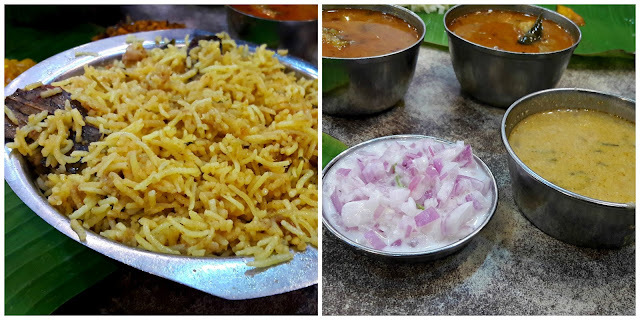 It was nice - the long grain rice is uniformly yellowish and a little strong on the flavor of cinnamon, more like a southern Tamilnadu style biryani. The friend who ordered it said the meat was tender. The mutton curry was more like a stew and wasn't quite an appropriate accompaniment to either kind of rice. 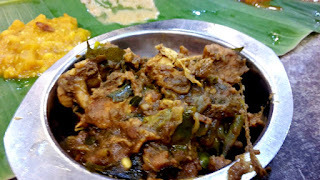 We also ordered the spicy but delicious chicken Chettinad. That, along with the fried fish were the saving graces. The food definitely didn’t taste like a Kerala meal, notwithstanding the name of the establishment. Of all that we ordered, other than the prawns, nothing was cooked in coconut oil (I know some folks can’t stand the taste of it). Nair Mess has a lot more on the menu - brain fry, omelette, mutton fry which are among the more popular items. It also has a very loyal clientele. Our bill came to 1111/ and that included the price of 4 small bottles of soft drinks. Service is quick and efficient, I guess they are used to the crowd by now. A meal for 2 should cost around 600/.